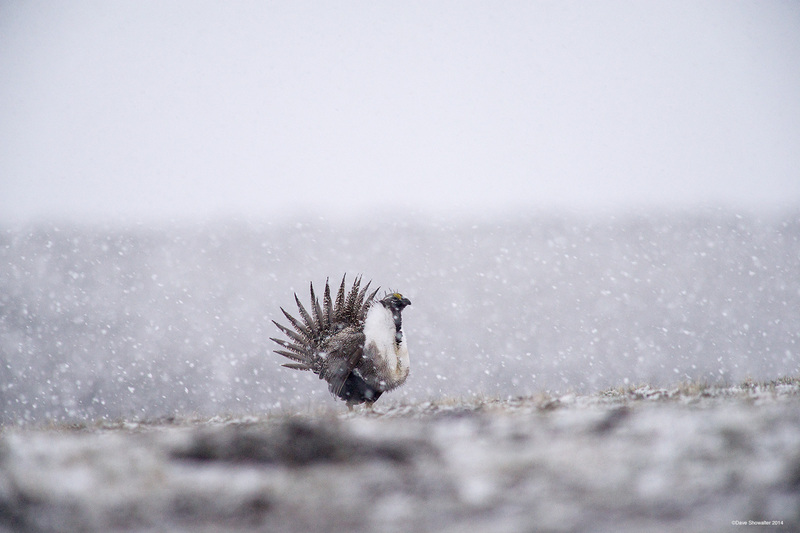 Sage-grouse perform their remarkable mating display in spring, foul weather or not. As snow increased to a near blizzard, this male kept displaying for a nearby female. The ultimate sagebrush obligate species, Greater Sage-grouse spend their entire life in sagebrush. Although they're a tough bird, Sage-grouse are vulnerable to development within four miles of their lek or mating ground. In steep decline for decades, Greater Sage-grouse are scheduled for a listing decision under the Endangered Species Act in September, 2015. Photo © copyright by Dave Showalter.